Just a few weeks ago the source code for Android 4.1 Jelly Bean hit the Android Open Source Project, which started the influx of custom ROMs for the Jelly Bean-capable Nexus devices. Now, just in case you've had any troubles with a custom ROM, there are official factory images to easily bring your device back to stock. 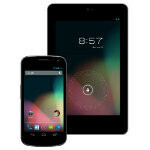 Today, Google has released the Jelly Bean factory images for the Nexus 7, the GSM Galaxy Nexus, and GSM Nexus S. Not surprising is that there's no factory images for the CDMA variants of the Nexus S (Sprint), or Galaxy Nexus (Verizon), which cannot be supported by Google as developer Nexus devices because of proprietary CDMA network keys. And, being a Nexus-only release, this also means no factory image for XOOM users, but given that the XOOM Jelly Bean update has just started, the factory image may be on its way. So, if you're interested in the custom ROM scene, and you were worried about the unofficial stock ROMs out there (which are really just fine), you can now rest a bit easier that the official factory images are available. sweeeeet. Cant wait for the NexusS image to be converted to a good SGS1 ROM. yep, been running the Vicious Jelly Bean 4.1.1 rom on my Galaxy Nexus and it's bad to the bone!